No matter whether you crave a little bohemian style or are looking for a wrap with warmth for those cool days, this crochet high/low poncho is a must-have. The attached hood will add even more protection from the chill in the air. This pattern is great for a beginner to intermediate crocheter as it uses simple stitches and is constructed with squares. The poncho is a fits-most teen to adult size. 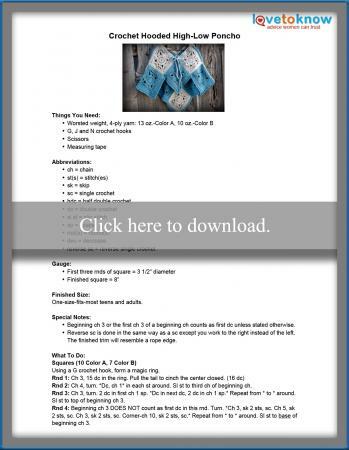 Click on the pattern image to download and print. Try the Guide for Adobe Printables if additional help with the download is needed. Personalize your poncho with a few changes to the pattern for a custom fit and preferred style. The following tips are a few to get you started. Adjust the pattern to fit a child or small-petite woman by adjusting the size of the squares. Each square is 8", but a thinner yarn and a smaller hook can shrink the size. A 5" square for a child size or a 6"-7" square for a small-petite size should fit the bill. Eliminating rounds on the pattern squares will reduce the size but will distort the shape and design of the square and is not recommended. If you prefer to use the same yarn weight as that is given for the pattern, choose another crochet square pattern that can easily be size-adjusted for your poncho. If a hood is not desired, simply eliminate the squares needed. Finish the neckline with the same trim used for the edge of the hood opening. You can also make a lighter poncho for spring using this pattern. Choose thinner yarn and a larger hook to adjust for gauge. Each square will appear loose, lacy, and airy. While this pattern used two colors, you can use multiple scraps. Gather all of you leftover balls from previous projects to create a one-of-a-kind poncho with a completely different look.